I created another walk-in panorama, this one I shot in front of Captain Khan’s headstone at Arlington National Cemetery. Before the Presidential election, few people outside the military had heard of Gold Star Families or could truly comprehend the enormity of their sacrifices. Stepping inside, people will find themselves standing in front of Captain Humayun Khan’s headstone and see flowers, small stones, a teddy bear and letters left for Captain Khan’s Gold Star parents, Khizr and Ghazala. 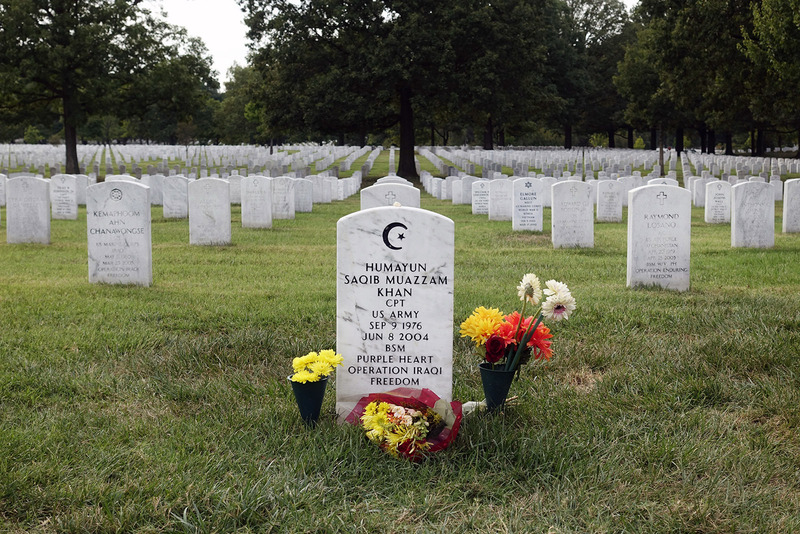 Surrounded by headstones spreading as far as the eye can see, viewers will see the Muslim Crescent Moon and Star on Captain Khan’s headstone alongside Christian, Mormon, Buddhist and other religious symbols. Off in the distance can be seen a funeral procession with a horse-drawn carriage as well as visiting Gold Star Families. I will be installing it in Erie Pennsylvania, a conservative part of a swing state, from October 27th until October 29th. Larry Walczak, founder or eyewash Projects, is the curator and it will be located at PACA in Erie.